Scabies mites construct their burrows in the skin of the infested animal or human. Termites construct burrows in wood. Some sea urchins and clams can burrow into rock. The burrows produced by invertebrate animals can be filled actively or passively. Dwelling burrows which remain open during occupation by an organism are filled passively, by gravity rather than by the organism. 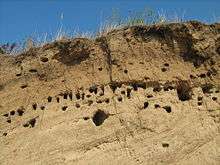 Actively filled burrows, on the other hand, are filled with material by the burrowing organism itself. Burrows are also commonly preserved in the fossil record as a type of trace fossil. ↑ Wilschut, L.I. ; Addink, E.A. ; Heesterbeek, J.A.P. ; Dubyanskiy, V.M. ; Davis, S.A.; Laudisoit, A.; Begon, M.; Burdelov, L.; Atshabar, B.B. ; de Jong, S.M. (2013). "Mapping the distribution of the main host for plague in a complex landscape in Kazakhstan: An object-based approach using SPOT-5 XS, Landsat 7 ETM+, SRTM and multiple Random Forests". International Journal of Applied Earth Observation and Geoinformation. 23: 81–94. doi:10.1016/j.jag.2012.11.007. ↑ Wilschut, L.I; Laudisoit, A.; Hughes, N.; Addink, E.A. ; de Jong, S.M. ; Heesterbeek, J.A.P. ; Reijniers, J.; Eagle, S.; Dubyanskiy, V.M. ; Begon, M. (2015). "Spatial distribution patterns of plague hosts : point pattern analysis of the burrows of great gerbils in Kazakhstan". Journal of biogeography. 42 (7): 1281–1292. doi:10.1111/jbi.12534. ↑ Dubiel, Russel; Blodgett, Robert H; Bown, Thomas M (May 1987). "Lungfish Burrows in the Upper Triassic Chinle and Dolores Formations , Colorado Plateau". Journal of Sedimentary Petrology. 57: 512–521. ↑ Varricchio, David J.; Martin, Anthony J.; Katsura, Yoshihiro (2007). "First trace and body fossil evidence of a burrowing, denning dinosaur" (PDF). Proceedings of the Royal Society B: Biological Sciences. 274 (1616): 1361–1368. doi:10.1098/rspb.2006.0443. PMC 2176205 . PMID 17374596. Retrieved 2007-03-22.